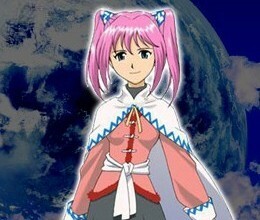 Below are some bios of the major characters from Lunar: Dragon Song. 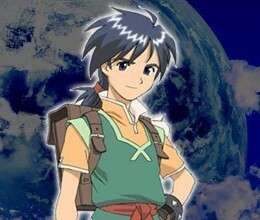 Jian lives in the port town of Searis, working as a courier for Gad's Express along with his childhood friend Lucia. But his heart is set on a higher goal of one day becoming a Dragonmaster. One day, he and Lucia get a request to deliver a package to the Beast City of Healriz. But the job is far from simple, and Jian finds out that not everyone shares his sense of justice and equality. Will this deter him, or will he press on to realize his dreams? Jian is a skilled athlete and can perform acrobatic tricks, using an array of kicking moves during battle. He cares for Lucia deeply and will do anything to keep her safe. Jian is a direct transliteration of his name from the Japanese version. The pronunciation is similar to the French name Jean (pronounced closer to "John", not with a long 'e'), but this wasn't used to avoid name confusion (considering Jean's name in EB was pronounced with a long 'e'). 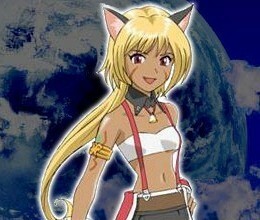 Lucia works with Jian for Gad's Express, and has strong feelings for him in return. She may be a year younger, but she makes up for it with her resolve, at times having to guide Jian in the right direction. But her destiny begins to change during their journey to Healriz; whether for better or for worse will depend on how events play out. Lucia's specialty is her ability to use the magic of Althena to support and heal the party. She can attack with her parasol if necessary, but she prefers to heal rather than harm. The original name of Eternal Blue's Lucia has a more elongated 'u' sound than the original name of Dragon Song's Lucia (i.e., "ruushia" versus "rushia"). This similarity was thought to be intentional--which is why the translation went with the name "Lucia". Later, the scriptwriter indicated that the similarity was not intentional. ...our apologies. Gabryel, or Gab for short, is unlike many other beastmen and beastwoman. In a world where beastmen are at the center of power, Gab rejects the idea that beastmen and humans are not equal--they all are blessed by Althena, so what real difference is there? This mindset draws her and Jian together, and her strength and determination help carry them through many difficult situations. But will her resolve be strong enough to carry through to the end? Gabryel is the strongest of the characters. She prefers close-range attacks with claws, but can also use magic attacks. The world of DS established that magic was very rare, and that, at this time, beastmen were more likely to be magic-users than humans. Also, Gab's full name was originally going to be Gabrielle, but this had to be shortened due to space constraints. Flora and her brother Peres have lived a very difficult life, staying out of reach of the Vile Tribe on the edge of the Frontier. 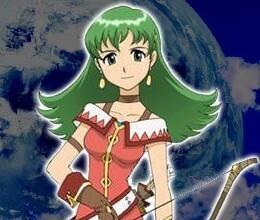 Over time, Flora has learned much about the Frontier, and has become a very skilled archer to defend herself. Like many humans, she has her own hopes and dreams, which the Vile Tribe cannot destroy. When she meets Jian, will she be able to realize them? Flora is skilled at long-range attacks using her bow. She also has healing magic. Rufus is a leader in the beastman army. Very strong and proud, he sees beastmen as better than ordinary humans. But once he encounters Jian, his mindset begins to change. Will his experience teach him finally to respect humans? Rufus is a skilled swordsman and prefers more traditional combat with blades. The US manual contains an error saying that Rufus is human instead of beastman. The game contents and Japanese manual correctly identify him as a beastman. Lord Zethos is the leader of the beastmen civilization, and possibly the most powerful beastman alive. 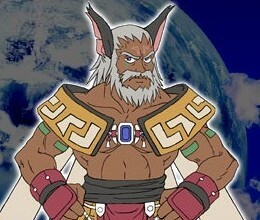 Lately, he has been assembling the strongest fighters in the coliseum at Healriz, in response to rumors of a tribe in the distant Frontier using dark magic. When a young human from Searis arrives to take the challenge, Zethos is far from pleased. How will he deal with this human rivaling his best beastmen warriors? Little is known about Ignatius, the ruler of the Vile Tribe. He is a master of dark magic, and seemingly invincible. He is said to reside in a large, ominous castle, deep in the Frontier. 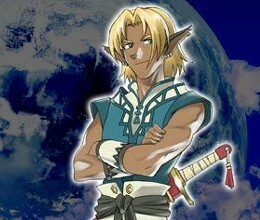 He inspires fear and awe, but what are his plans for the Vile Tribe and for Lunar? Gad is the owner and proprieter of the world-famous Gad's Express courier service. Jian and Lucia are two of his best employees. He's the catalyst for much of the story--because of him, Jian and Lucia journey to Healriz and begin their true adventures. Throughout the game, he regularly offers encouragement and support. Titus is a priest of Althena living in Healriz. He knows plenty about Althena, Dragonmaster, and the history and legends of Lunar. 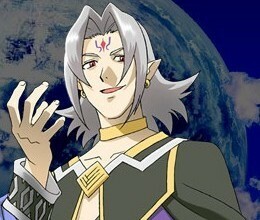 Peres is Flora's older brother. The two of them have spent much of their life evading the Vile Tribe on the edges of the Frontier, and they know a lot about the surrounding territory. Ezekiel is Lord Zethos's right-hand man and advisor. He is also a skilled fighter. Jude is one of Ignatius's henchmen and carries out much of his dirty work, particularly those which require more skill than brute force. Gideon is one of Ignatius's henchmen and carries out his more brutal work. He has a much more monstrous appearance than many others in the Vile Tribe.